Have You Updated Your Partner’s “Love Maps” Lately? 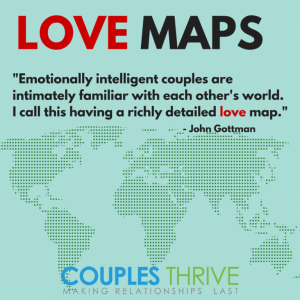 Couples who report sustained friendship and satisfaction with their significant others make an effort to stay on top of their partner’s “love maps.” Love maps are the little things about your partner’s life that you keep stored in your memory. Things like your partner’s all-time favorite meal, or what they like to do for fun, any upcoming work projects that might be stressful or their deepest insecurities about being a good parent. These leave a lasting imprint and are used to fuel the relationship for the better. When you know your partner’s inner world, you can use their love maps to the relationship’s advantage by providing support in times of worry, making them feel special when they need it the most and acknowledging the importance of their fears and aspirations. But it’s not just about knowing your partner’s love maps that makes a different. It’s taking action and using them to gain a more intimate connection and long-lasting friendship. As individuals, We evolve and change over time. Who we are today is not who we were five years ago. We adjust our perspectives on life, have different goals and identify new aspirations constantly. Keeping up to date with one another is essential for maintaining a deep bond with your partner. If you haven’t updated your partner’s “love maps” recently, spend some time getting reacquainted. Below, you’ll find 21 helpful questions to familiarize yourselves with your partner’s current likes, dislikes, dreams and innermost desires. Quiz each other and have fun getting to know your partner’s love maps. What is your favorite thing to do with me for fun? How do you envision our family’s future in the next five years?